Langho village has a bit of a split personality. The 'new' village blossomed at the height of the railroad boom of the Victorian period and seems quite different from the older part of the village, now called Old Langho to distinguish it from the new development. A new church was built to serve the growing population, leaving the Old Church to dwindle into disuse and decay. 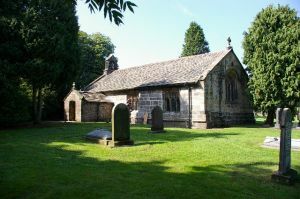 As for the Old Church of St Leonard, it was built in 1557, using stones from the dissolved abbey at Whalley. The date of construction is unusual in itself, for very few churches were built in England in the years immediately following the Reformation and the start of the Elizabethan era. The building is of sandstone blocks beneath a slate roof. It is a very simple building, with just a nave and continuous chancel, south porch, and a Victorian north vestry. The interior stonework is very well crafted and includes a piscina, font, windows, and carvings. The high quality of the carving suggests that most of these pieces were salvaged from the ruins of Whalley Abbey and simply reinstalled here. This may include the timber roof and bits of medieval stained glass in the chancel. Something that did not come from the abbey are the Jacobean benches, which feature some extremely good carvings on the bench ends, which include the date of construction and initials. Langho Old Church is not in regular use for worship and is cared for by the Churches Conservation Trust.